Like last year’s The Witch, Get Out has so much subtext that two people sitting next to each other could see an entirely different movie. That’s part of Jordan Peele’s genius, and while Peele definitely has experience with Key & Peele, it is still astonishing that someone has made a first film so full of power, thrills, humor, and terror right out of the gate. Jordan Peele’s talent and skills are without question, and I hope his singular voice doesn’t get diluted by the many studio cookie-cutter blockbusters that will surely get thrown his way. I also have to admire Blumhouse Productions, who to me have become the premier horror studio right now. They not only find fresh new voices, but give directors like M. Night Shyamalan, Scott Derrickson, and even Barry Levinson room to explore genre and craft in ways that give them their freedom. Get Out feels like the culmination of Blumhouse’s work thus far, and to dismiss Get Out as just another horror film would be making a serious mistake. Peele juggles both the horror and the humor masterfully, and his script is smart and full of ideas. But Get Out isn’t just a horror amalgam of what it means to be black in 21st century America. It’s also an examination of white motivations, and how every interaction can be suspect on some level. There is distrust in every moment, but our social mechanisms demand that Chris go with the moment even when every bone in his body is screaming at him to escape. To just “get along.” Even when Missy hypnotizes Chris to supposedly rid him of his smoking addiction, Chris goes along with it even when every signal is warning him of danger, because the Armitages don’t really want to hurt him, do they? Do they? Rose assures Chris that her parents are harmless, but for Chris, who has experienced tragedy and feels incredibly guilty about his place in the world, it’s easier to just let conflicts slide, because while things can be awkward and weird between Chris and Rose’s parents, they aren’t really out to get him… are they? Of course, as things tend to do in horror films – and make no mistake, Get Out is a horror film – things do go badly for Chris, and while there are few out-and-out scares in Get Out, the film is steeped in unease and tension. Only humor provides respite from the fear and terror we feel for Chris, humor that is expertly brought by Lil Rel Howery, who plays Chris’s TSA friend Rod. Every moment he’s on screen elevates the movie, and makes the more intense moments even more so. Horror and humor go hand-in-hand in the great movies of this genre, but rarely have I seen a director use both as effectively as Jordan Peele does. We laugh because it eases the intensity, until we realize we’re just being set up for something even more gruesome and disturbing. For many, Get Out will play as a kind of validation. 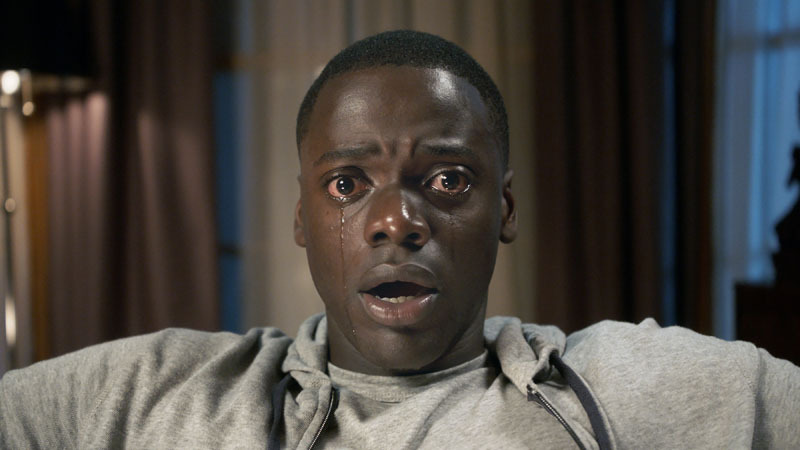 For others, Get Out will serve as an exploration of what black men in America must feel at some level every day of their lives, navigating through the world, unsure of who is out to hurt or exploit them. 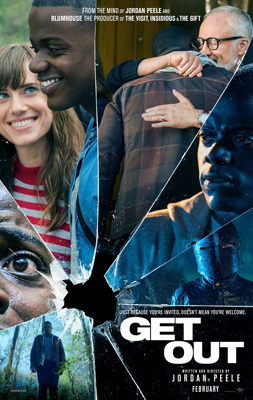 Get Out invites many interpretations, but what the movie most wants to do is to have its audiences understand that all motivations are suspect, and even the supposed good intentions of Dean and Missy Armitage have poison and anger behind them. When Dean says that he would have voted for Barack Obama a third time, who is he trying to help, the country or himself? Get Out is masterful in how the paranoia and unease rises, and how we become trapped in social constructs in our fear of seeming rude or unpleasant. Chris is willing to let the social unease slide, until it becomes too late. I can only come at Get Out from my own perspective and understanding as, frankly, a middle-aged white guy. But what Get Out affirms to me, more than anything, is to be empathetic, to have a readiness to understand another person’s point of view, even if you do not agree with it. There are boundaries that we create in our society and it is only our willingness to explore other ideas and experiences that keeps us from being entrenched in our stale dogmas and belief systems. Get Out is about the horrors of racism, but wrapped in a wildly entertaining horror-comedy that, perhaps, gets to the point much more directly than films like 12 Years a Slave or The Birth of a Nation can, because it is very much in the now. The insidious monster of racism changes to fit the times, but it never really goes away. In that aspect, Get Out is a monster movie in the purest sense, and we can never expect what kind of boogeyman lurks just around the corner. We expect it even less when we see that the boogeyman is us. This is a great film.